bareMinerals Skincare just launched on March 3rd! I recently got a sneak peak during a special blogger preview at Tzigan Lounge at Villa Pacri. Every formula in the bareMinerals Skincare line is powered by 100% pure RareMinerals ActiveSoil Complex, which results in products that are clinically proven to deliver increased cell turnover, noticeably smaller pores, increased luminosity and fewer fine lines and wrinkles. I learned that the minerals in RareMinerals ActiveSoil Complex have a greater antioxidant capacity than a pomegranate or blueberry. Exfoliating Treatment Cleanser, $26 - powder cleanser (previously known as Renew & Reveal Facial Cleanser) that you mix in the palm of your hands with water to form a light froth. This can also be used as an exfoliating mask twice a week or as a gentle exfoliating cleanser when mixed with Purifying Facial Cleanser. Purely Nourishing Moisturizer, $28 - formulated for combination skin to improve skin tone and texture, providing long term hydration. Purely Nourishing Cream, $28 - formulated for dry skin with a rich texture - a luxurious cream in a jar. 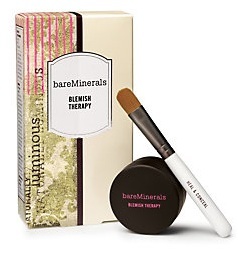 Blemish Therapy, $18 - an acne treatment in a powder form to help heal and prevent future breakouts. Comes with an anti-bacterial brush. 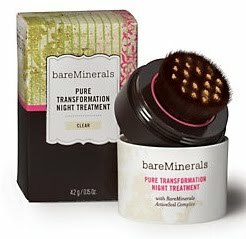 Pure Transformation Night Treatment, $60 - powder night treatment with the highest concentrated form of RareMinerals ActiveSoil Complex with Vitamin C. Available in 4 shades - Clear, Light, Medium and Tan (the powder will not leave a trace on your pillow or sheets) to instantly diffuse imperfections as you look your best before going to bed. Comes with a soft, synthetic brush. Also known to reduce pore size up to 33%! There are also Naturally Luminous Daily Duo 30-day cleanser/moisturizer kits available for combination or dry skin for $23. I can't wait to try these new products! Especially the Pure Transformation Night Treatment! Who doesn't want to wear a product that makes you look fabulous before you go to bed? Ever since I switched from liquid foundation to bareMinerals MATTE SPF 15 Foundation, I am so open to trying more products in a powder form! 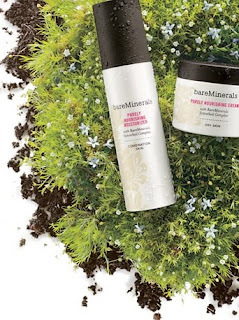 The bareMinerals Skincare line is now available at Bare Escentuals boutiques, BareEscentuals.com, Sephora, Ulta and departments stores , fine spas and salons that carry Bare Escentuals products. Good post. It is really help to us.